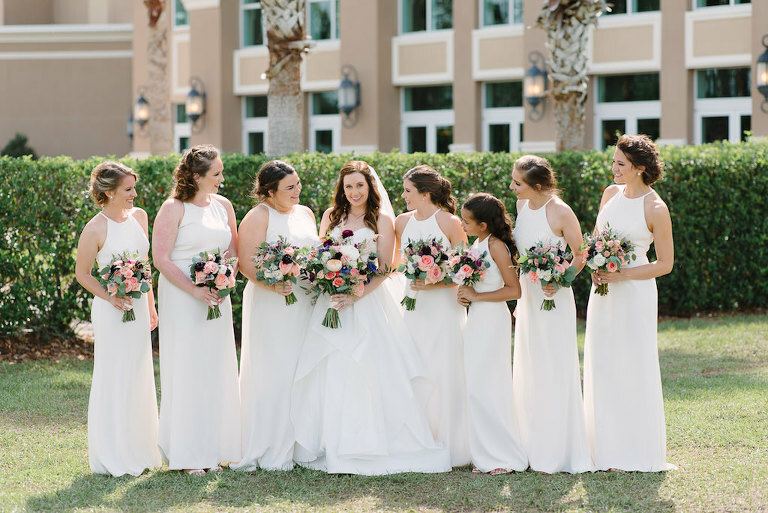 Brooke and Mason’s downtown St. Pete wedding featured pink, purple, and peach florals, elegant blacks and whites for the bridesmaids and groomsmen, and a softly lit reception at unique wedding venue NOVA 535. 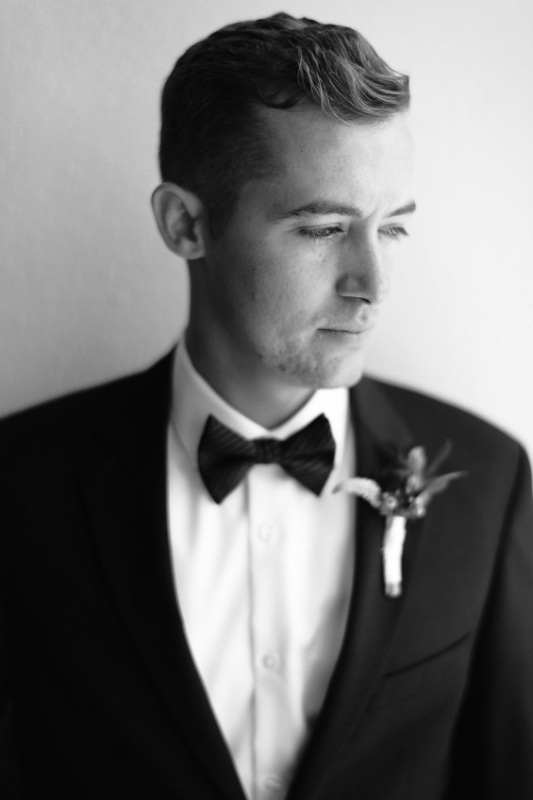 “We wanted something classic and elegant, but still very fun and us,” the bride shared. Adding to the classy affair, Brooke’s bridesmaids wore beautiful white column halter dresses from South Tampa bridal shop Bella Bridesmaids. 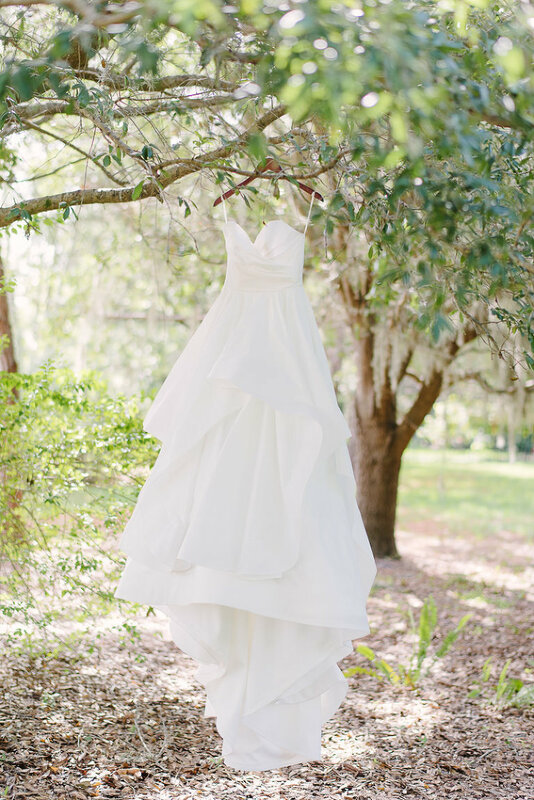 “I had a hard time deciding what color to put my bridesmaids in, so I just went with white and absolutely love how it turned out!” the bride gushed. Both Tampa natives, the couple married locally to celebrate with their friends and family. They searched for a unique St. Pete wedding reception venue to make their big day a representation of themselves, as well as memorable. The decor for the bride and groom’s romantic reception featured greenery garlands, white linens with gold accents, pillar candles, and Edison bulbs hanging from the ceiling. The soft lighting perfectly complemented the exposed brick walls of the venue. One of Brooke’s favorite wedding day moments was dancing with her new husband during the reception. “Our first dance was such special moment because my sister-in-law, Nancy, wrote and recorded a song for us and surprised us with it. 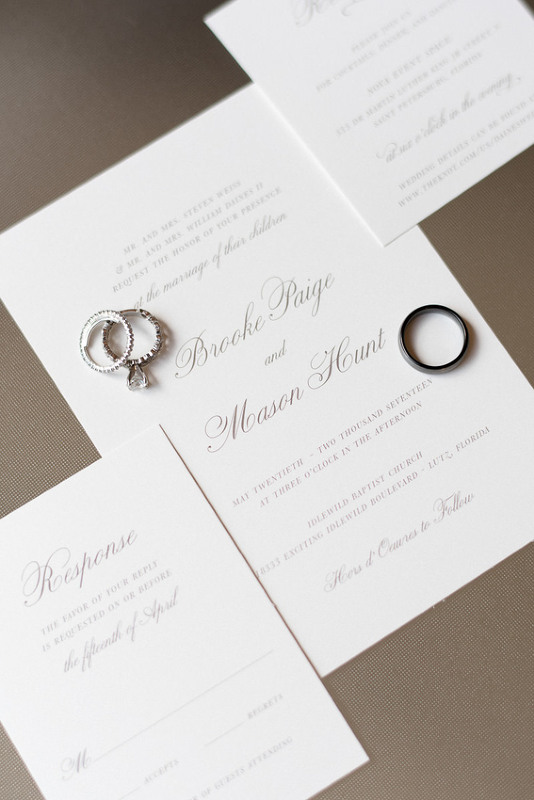 We will always have that memory of dancing for the first time as husband and wife,” Brooke reminisced. Mason proposed the day I graduated from college! He set up a table with pictures, flowers, candles, and a sign on the Riverwalk. He completely surprised me! Both of our families were there, and it was really special! We wanted something classic and elegant, but still very fun and us. The colors of the wedding were in the flowers, which were shades of pink, purple, and peach. The men wore black and the women wore white. I had a hard time deciding what color to put my bridesmaids in, so I went with white dresses from Bella Bridesmaids and absolutely love how it turned out. For our reception we knew we wanted something with enough space for our guests to mingle and also something different! We loved NOVA 535 as soon as we saw it! It has so much space and they allowed us to personalize the space to make it feel like “us”. The service was incredible, it was the best choice we could have made! Don’t stress too much during the planning process; it all works out in the end! When the day comes you won’t care about any of the little details, just that you are married and surrounded by all the people you love!